San Francisco is full of fun things to do on Saint Patrick's Day, including the annual parade, pub crawls, and live performances. The city is also home to more than a dozen Irish bars and restaurants. This year, the holiday is on Sunday, March 17 and most festivities will take place this weekend. Read on to find a list of ways you can celebrate, places with the best Irish dishes, top Irish bars, and other activities planned for the official celebration weekend. 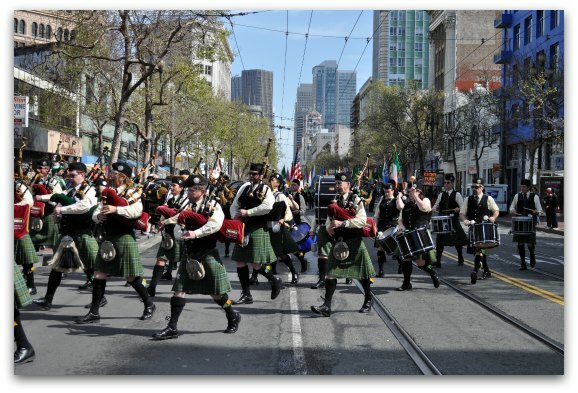 Every year, the United Irish Societies of San Francisco hosts a large Saint Patrick's Day Parade. The 2019 celebration is set for Saturday, March 16. The highlight of the event is the Saint Patrick's Day parade which starts at 11:30am. The parade route begins at 2nd and Market streets and heads straight down Market Street all the way to Civic Center Plaza near San Francisco City Hall. The festival has been cancelled for this year, but should return next year. Every year, many of the Irish pubs in SF also celebrate the holiday. Here are a few of the top events scheduled this year. Every year, the Irish Bank celebrates with two fun block parties. The Irish Bank is located at 10 Mark Lane in the Financial District. The annual Saint Patrick's Day Street Party in front of the Royal Exchange and Harrington's Bar & Grill is scheduled for Friday, March 15. The party is on Front Street (between Sacramento and California Streets). The street closes down around 3pm and the party starts at 5pm. The party runs until 10pm. Head over to the Financial District for this fun annual event. Head over to Jackson Square alley for this year's Saint Patrick's Day Street Party at Taverna Aventine. The fun starts at 4pm on Friday, March 15th and runs until 1am. It's free to enter when you RSVP in advance or it's $5 at the door. Taverna Aventine is at 582 Washington Street. This North Beach Irish pub features Irish music on Saint Paddy's Day. They have bands on stage all weekend long. Friday night you will find Gotcha Covered on stage. On Saturday night, Daze on the Green plays. On Saint Patrick's Day, you will find Fast & Vengefully playing all night long. Maggie McGarry's is at 1353 Grant Avenue. Get in the Irish spirit on Saint Patrick's Day at the Buena Vista Cafe. All day long, they will be serving up corned beef and cabbage, Irish soda bread, and other Buena Vista favorites. And...of course, make sure to enjoy at least one of their Irish Coffees during your visit! They are open from 8am to 2am on Sunday, March 17. If you want a traditional Irish meal, or a place to just hang out for St. Paddy's Day, click the link below for information about SF's best Irish pubs and restaurants. If you're not into the party scene, or are looking for something to do before heading out to the pubs, here are some additional activities planned for Saint Patrick's Day and the weekend. You will find a variety of performance on stage this Saint Patricks Day in San Francisco. They range from Broadway hits to off Broadway and local creations at smaller theaters all around town. This weekend's biggest show is Hamilton at the Orpheum Theater. Are you looking for something to do during the day on this holiday? If so, head out on the water on this 60-minute SF Bay cruise. This fun adventure will take you past SF's top attractions, including Alcatraz, Angel Island, and Sausalito. You will also get the chance to cruise under the Golden Gate Bridge - twice! The tour runs all day long. Another fun option for Saint Patrick's Day in San Francisco is the Twilight Cruise on the Bay. This two-hour cruise offers views of the SF Skyline along with live entertainment and a hearty appetizer buffet (sandwiches, salads, fruit, and desserts). A full bar will also be open on board where you can purchase both hot and cold drinks at a reasonable price during your cruise. Both indoor and outdoor seating is available. The renowned SF Symphony also performs on St. Patrick's Day. The show is at 2pm at the Davies Symphony Hall near SF City Hall. On this particular evening, you'll get to enjoy Christian Tetzlaff as he plays Mozart with the SF Symphony. There are several great places in San Francisco to stay on St. Patrick's Day. Since most of the action is in and around the downtown and Union Square areas, I recommend looking for a hotel near one of these districts. Both of these neighborhoods offer a variety of public transportation options, so you can easily get to the rest of the city from here. Take a look at these recommendations based on budget, amenities, and location. You can also look for discounts on TripAdvisor or Booking.com before you book your hotel. They offer several discounts on room rates, parking, wifi, and more. Click the links below for details. St. Patrick's Day always coincides with the NCAA basketball tournament. This year's tournament starts on the following weekend, but they are doing selections on Saint Patrick's Day. Here are some of the places in San Francisco where you can celebrate and also watch the games. 1. Johnny Foley's Irish House: This is a great place to watch the games. I recommend heading toward the back of the bar where there are several TVs. From here, you can watch the game from either the tables or from selected seats right at the bar. 2. Kezar Pub: This small but popular Irish bar is also a great place to watch the basketball tournament. You'll also get to mingle with locals and sample the pub's amazing "bangers & mash." The bar usually opens around 11:30am and is located in the Haight-Ashbury District just steps from Golden Gate Park at 770 Stanyan Street. 3. Union Square Sports Bar: The Union Square Sports Bar is an interesting place. It's a great sports bar with a number of TVs, but it's also a bit of a dive bar and sometimes you'll find a few sketchy characters that hang around outside. The neighborhood is safe, however, as it's just a few blocks from Union Square. They don't have food, but they have a large selection of beers and a lots of TVs for the size of the bar. Find them at 115 Mason Street. 4. Nickie's: If you prefer to focus on the basketball tournament rather than the Irish celebrations, then Nickie's is the place for you. This sports bar in the Lower Haight neighborhood offers pub food all day as well as a great selection of beers. They normally open around noon and you will find them at 466 Haight St.
5. Greens Sports Bar: Another place to watch basketball is Greens Sports Bar in the Russian Hill neighborhood. This place is usually really crowded, so plan on standing for a while until a seat opens up. It's a bar only, no food, but a great place to watch the games. Here you'll mainly find locals from the surrounding neighborhood. Greens normally opens around 10am and is at 2239 Polk St.